A little while ago, I was surfing around and you will never guess who I ran into? None other than a very well respected knife expert, author and fellow auctioneer- Mr. Bruce Voyles. No, we didn’t really run into each other; instead I ran up on his blog. Yes, you read it right- his blog and yesterday was his first post, or first since January. You just thought I was the only hyper-techie knife guy who blogged didn’t you? 🙂 Not any longer. Yes, I do know there are a handful of knife folks who blog- but very few, that is until iKnifeCollector was created a month ago. Now that knife collector community is growing in knife blogs. But outside of our community, there are very few that aren’t trying to sell you a knife or something. Bruce’s blog is entitled Knife Comments by Bruce Voyles. I encourage you to drop by and welcome him to the blogosphere. I am tickled to see him joining us by providing free thoughts and observations from the world of knives. Oh, yeah, while you are there let him know we’d love to have him a part of iKnifeCollector. We have a captive audience for his blog (as well as his own personal My Page just waiting on him). He belongs in our community, not out in cyberspace among the millions of other bloggers vying for our attention. We are over here. Bruce is a tremendous asset to this hobby and is one of its founding pioneers. He has authored many books on knife collecting, including my favorite The IBCA Price Guide to Antique Knives. Auction prices are a real- time reflection of the market- at that time and under those conditions. Voyles Auction #42 is now closed and it was a success. Clearly the majority of the lots sold for well in excess of their minimums. The auction inventory consisted of all types of knives- customs, vintage and current productions. The caliber of the knives were from just under $5000 to under $50. 135 lots were offered (a lot in many cases included more than a single knife). It appears 131 lots sold, however a few of the lots minimum didn’t appear under the description. 4 lots failed to reach the published minimum and 9 lots sold at their published minimum. Total sale right here before Christmas was a tad over $36,000, before you add the Buyer’s Premium (13% for credit card purchases, otherwise 10%). 5 lots sold for over $1000. Lot #1 was the only one to sell for over $2000. This knife was the highest sale in the auction. It was a Gray Taylor, Kingsport, TN exquisite folder. Tortoise insert in the interframe, relief engraved with gold inlay throughout, gemstone thumbstud. 3 ½” long closed, hand rubbed finish. It sold for $4650. 9 lots sold for between $500 to $1000, with the balance of 121 lots selling for under $500. Like I said, this auction had something for everyone. OK, it won’t be easy, but I’ll start our group session today. My name is Scott King and I am an auctionholic. When I get around an auction and hear the rhythm of the auctioneer’s chant something happens (like what happens to the hulk… except I don’t turn green and bulk up…instead, I just start raising my hand). Actually, it is a genetic thing. I grew up going to auctions. 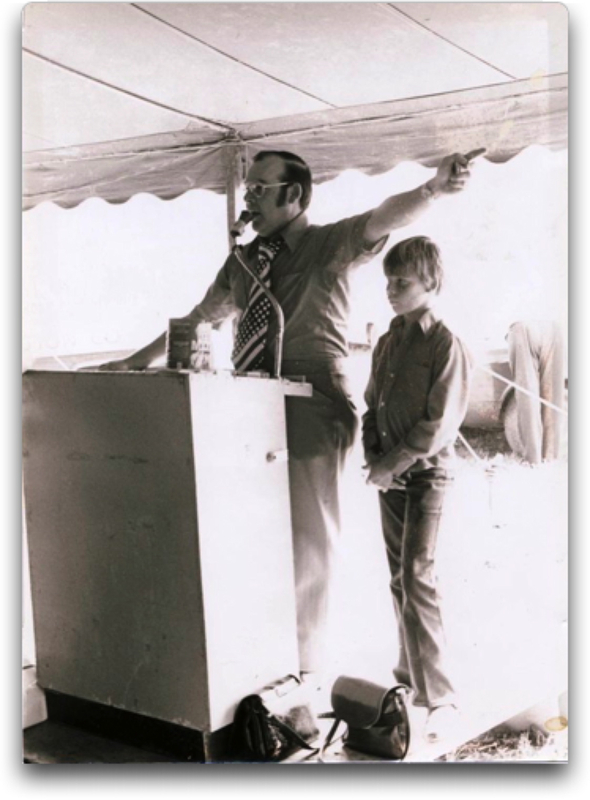 I remember when I was 10 years old standing up on the podium with my father while he was auctioning. Yes, my father was an auctioneer, as was his father, and as was his father. It is an understatement to simply say auctions are in my blood. If I’m not involved with putting on the auction, then I have to buy something. So, all the way back to 1915 and for 4 generations (Yes, I’m an auctioneer too, as is my brother and younger sister) we have been auctioneers. Last Friday evening I posted I was going to Bruce Voyles’ Knife Auction. Yeah, I knew better than to go. I had already determined there was nothing I was interested in, but what else did I have to do while out of town on a Friday night? Plus, I was so busy at the knife show playing CNJ I hadn’t bought anything. How many times have you gone to a knife auction and ended up starting a new collection? Yes, I know that sounds crazy, but like I said when I go to an auction I have to buy something. Well, something I did buy. To save you from the lot by lot, increment by increment (auctioneer’s lingo) description, I started off by buying a broken Marbles Folding Hunter…don’t ask why, but it was the beginning of me falling off the wagon. Mark Zalesky just rolled his eyes at me when he saw I was the high bidder on the MSA. Then I proceeded to start a folding hunter collection. In the story: How do you go about deciding to buy a knife? I had unsuccessfully tried to impulsively buy a half dozen of them earlier this month. So, what about you? Confession is good for the soul. Don’t you just love Knife Auctions? Guess where I am going here in a few minutes? A knife auction. Yeap, you know everybody loves auctions- they are fun, plus there may be some deals to be had (on a knives you wouldn’t have bought otherwise. Isn’t that the way it usually goes?). 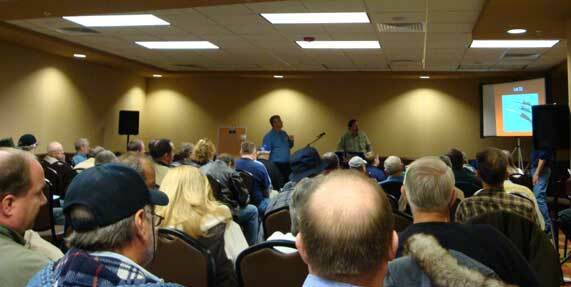 Tonight Bruce Voyles is conducting a 1000 knife auction held in conjunction with Parker’s Knife Show. It is going to be interesting to see what today’s market prices are. The knives are going to be sold at Absolute Auction- without any minimum bids or reserves. Therefore, market value will be demonstrated in real time. I’ll report the results in the CNJ Weekend Edition, plus I’ll summarize my observations of Parker’s Show. Are you into custom knives? I have to admit they do catch my eye, but I try not to be tempted. If you are OK with looking then check out this preview. According to the catalog I received today, the date for bidding to begin is August 26th (that’s tomorrow!) with the deadline for bids of August 28th. Check Bruce’s website for more info.